Well, series 20's reviews may have ended a few weeks ago, but series 21 is now here (nice for them to wait until I'd returned from holiday to air them)! And, as is common with the first few episodes, they're debuting in the UK! Hopefully the others do too so that my job is made easier, but I highly doubt that. Anyway, let's get the ball rolling with Springtime for Diesel! Did the team write this episode, then watch The Producers, hear Springtime for Hitler and say "that should be the title for one of our episodes!"? I like The Producers, don't get me wrong, but it feels really odd that they'd possibly want to reference that than just focus on the spring problem. But that's besides the point. Diesel has been a fascinating character in recent years. Once a devious antagonist, he's now become more complex to the point where his deviousness feels more like an old habit that he can't shake off. If I could compare him to anyone, it would be Discord from Friendship is Magic. And if that's the route Diesel continues to go down, I feel that would suit him much more than being a generic antagonist. We have Diesel 10 for that. Also, Daisy continues to be a real delight. 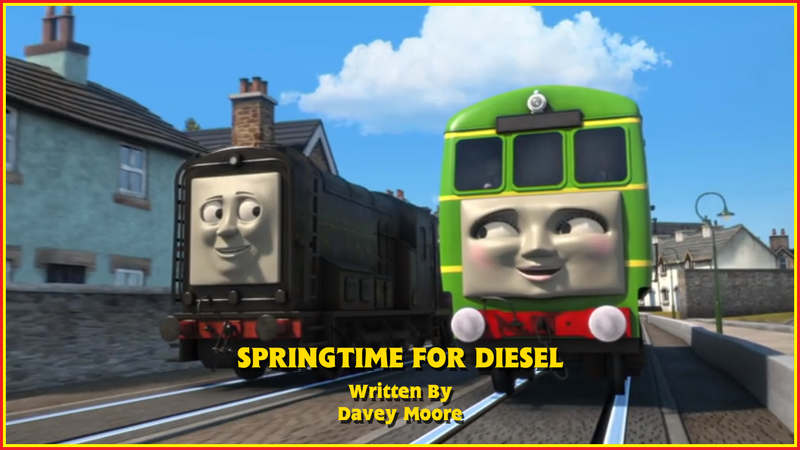 Her interactions were excellent as always, and her teaching Diesel about friendship felt like a great continuation of what she went through in series 20, Ryan & Daisy especially. Also, she puts Connor to shame in terms of bravery and determination. I don't want to dwell on it too much as I don't like thinking about Cautious Connor that much (it's an OK episode, but its problems stick out like a sore thumb), but Daisy getting her passengers home on a broken spring is one of the shining moments for her character. Considering how much she complains about being damaged, I expected her to stay there and let Ryan do the rest. But I was surprised, and glad, to be proven wrong. She truly has become one of the best characters of the show, which feels weird to say since she's been absent from a large portion of it. But it's a testament to how brilliantly the current CG era nails character interactions, and how much Davey Moore just gets her completely. Speaking of which, Den and Dart had some really fun lines as well. Them being surprised to see a diesel railcar was a bit weird (a nitpick I know, but didn't she go there in The Railcar and the Coaches? ), but the rest were fantastic. It's nice to see Den actually stand up for himself after Dart's constant "what he means is..." lines over the years, and the toilet humour they provided was actually kind of funny. Sure, it was one of the more blatant uses, but at least the set up to it made sense. The story itself was fantastic. It's well paced, it's engaging throughout and it's nice that the diesels got all the attention. It did feel like they were segregating them from the steam engines, considering only Thomas, Percy and Ryan appeared, but it was a nice change of pace that they got all the attention for one episode. The ending was really well done, too. We've seen two episodes where there's been dialogue that's hinted on a complete backpedal of a character's development. (thankfully, James' case was rendered pointless in All in Vain). But this feels just right. There's enough ambiguity there so they can revert him back when necessary, since he's still getting the hang of friendship. But there's also enough to make you believe that Diesel genuinely wants to grow and be a good friend. This development is long overdue for him, and I love that they're finally taking him down this route. I also love how taken aback Ryan is by it. I think that using Duck would've had more of an impact, but it was still fine. There's only really one problem: how do the workmen not know how to fix Daisy's springs? It genuinely feels odd that they've never had experience with them before, especially with how temperamental she can be. It would've been better had they just said there were no springs in stock, something they mentioned when Annie had a wheel flat in Thomas & the Emergency Cable. The way it's written here, it makes the workmen seem rather stupid. It's not something that damages the story completely, but it's definitely something that could easily have been altered with a final draft. I've never given an opening episode top marks before. Old Reliable Edward came close, but its lack of originality held it back slightly. This episode has no such issue. The story feels fresh, the characters are superb, the theme is fantastic and... well, there's honestly little to complain about. Fans have been dreading the future of the show after Journey Beyond Sodor to the point they've wanted it cancelled (because that's how selfish fans are). But if the quality remains this high throughout, they'll have nothing to worry about. For this series, at least.